Here in the western half of the country our wide-open spaces are wonderful places to pause in blessed silence and breathe in a stunning vista. To feel connected to the earth, as both its servant and its conqueror. It’s this vastness, this feeling of endless possibilities, that also makes the west a surreal backdrop for weird and wonderful art, much of which – lucky for you – is just a drive or short flight away. You can get tacos al pastor almost anywhere in SoCal. But there is only one spot in the world where you can pair them with a freaky art garden—all handcrafted by owner Martin Sanchez since 1995. Expect to see trash-into-treasure details like mufflers, soda bottles, and shells transformed into sculptures (many with water-spurting genitalia and breasts) and even a Catholic cathedral. With horchata in hand, delve into humanity’s scandalous-meets-sacred, whore-Madonna complex. Your wheels, Gioachino Rossini, and a lonely road. They have more in common than you think. For a commercial in 2008, Honda grooved a section of the highway to play the William Tell Overture while driving over it. Because of noise complaints, the installation was moved near the airport. For the optimal car concert, drive it at 50 mph. Although, if slow jams are your thing, 35 mph works too, and it’s kind of funky. After playing the Lone Ranger theme song with your tires, order up a peanut butter burger at Foxy’s Landing and Restaurant just a few blocks away. Darwin is a true artist’s enclave. Population roughly 35—nearly all creative types. However, unless you know a Darwinian, studios aren’t open to the public. What you can see is: a giant Christian ichthys stone marker—complete with evolutionary legs (get it, Darwin? ); some Jim Hunolt sculptures (a pair of dolomite monoliths and a white cast embracing couple); and Hal Newell’s memorial (a dozen huge stones in a circle) to his father, sculptor Gordon Newell. Plus, transitory land art, like the Peace Tree of recycled microwave/TV wires, and cool old ghost town relics from the town’s mining heyday. Sure, there are cool Candy Cane Lanes all over greater Los Angeles area (Woodland Hills, Altadena, etc). But there’s only one place to find twinkling microwaves, mannequins, shopping carts and, yes, even toilets. For the past 30 years artist Kenny Irwin has hung over eight million lights with recycled bric-a-brac to complete the annual holiday oddball masterpiece. Much like the Prada Store outside Marfa, Texas, this installation is an advertorial roadside attraction set against a desolate backdrop. For the most arresting experience, go after sunset when the large-scale panoramic images, by photographer Peter Lik, glow eerily from the gallery’s windows. 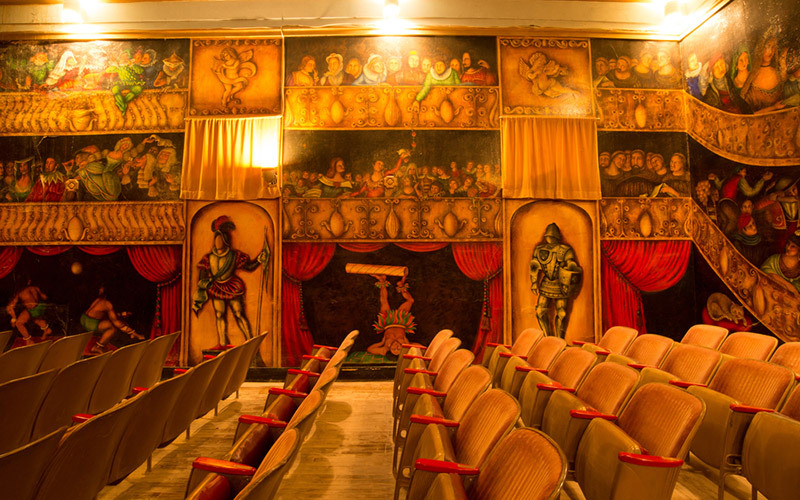 And while in DV, watch a performance at Amargosa Opera House—opened (with beautiful interior murals) by legendary dancer Martha Beckett more than 40 years ago. “Island art from the heart” is this artist’s motto, according to a tile placard at the studio’s entrance. A resident Catalina Island creative for over 40 years, Will Richards welcomes visitors to his ever-evolving studio of eclectic, upcycled creations, from paintings to sculptures. A sign on the premises reads: “Will is extra busy, please make visits short.” You were warned. Good things come to those who wait. Like who really wait, as in nearly a half-century. The art installation, started in 1972 by artist Michael Heizer (same guy behind LACMA’s huge outdoor rock AKA Levitated Mass), is more than a mile long and a quarter-mile wide. Inspired by Chichen Itza’s Mayan ruins, it’s slated to be the world’s largest natural sculpture—and at $25 million and counting, perhaps the most spendy as well. Because the Obama administration designated the surrounding land as the Basin and Range National Monument, the public will have access, but not until May 2020. Until then, you need Heizer’s permission (he owns the land it’s on) or a helicopter for a bird’s-eye view. RELATED: All The Weird Desert Art Within Road Trip Distance Of L.A. If you saw Cavedigger, the 2014 Oscar-nominated documentary, you know about Ra Paulette’s passion. Over the span of 30 years, the underground (quite literally) artist has hand-carved 14 epic cathedral-esque caverns to explore—each uniquely designed. Origin, a nearby resort in Northern New Mexico, offers guided tours and a sound bath experience within the caves. On a clear day it looks like a sci-fi experiment gone awry. But when a storm strikes, the 400 stainless steel rods, installed by sculptor Walter De Maria, are transformed to a Fantasia-style performance compliments of Mother Nature. It’s pure magic to see (and hear) bolts of light dance across the sky. Book the onsite three-bedroom cabin early—like, a year in advance—because it sells out fast. Need theme music while you wait for the thunderstorms to roll in? Download Snow Patrol’s “The Lightning Strike.” Cell service isn’t a thing. Even sans storm, it’s still a pretty epic experience to wander around the mile grid of 20-feet high poles, spaced 220 feet apart, especially during sunset and sunrise. Architect Paolo Soleri, a protégé of Frank Lloyd Wright who recently passed at age 93, created a futuristic yet humble earthen compound dedicated to his handcrafted ceramic and bronze wind-bells. (Best Scottsdale souvenir, hands down.) Today, his students carry on his vision both at Cosanti and Arcosanti, a larger ecology-meets-architecture campus roughly an hour and change away. While you’re in town, don’t miss Soleri’s final work—a stunning sundial and bridge in downtown Scottsdale, James Turrell’s “Knight Rise” at SMoCA, and Frank Lloyd Wright’s Taliesin West. Plus, there are dozens of super cool permanent and temporary public works (like Los Trompos) throughout the city by well-known artists. L.A. has plenty of iconic Instagram-friendly murals. (Got your wings on at Collette Miller’s Angel Wings yet?) In Idaho, an entire city block of photographic walls await. What began in 2002 as a singular drawing by artist Colby Akers on the backdoor of a cafe is now the largest outdoor gallery in the northwest. The murals are ever-evolving as older pieces are painted over or incorporated into new works. Freak Alley Gallery features a roster of regular artists and an indoor gallery. Hotel tip: Inn at 500 Capitol, Boise’s newest boutique stay, opens December 31, 2016. Details: Located on Bannock Street, between 8th and 9th Streets in downtown Boise; open 24/7; the indoor gallery (210 N 9th Street) is open first three weeks of the month between September and mid-July. What do Alexander Calder, Frederick Chopin, and cattle have in common? They all converge in a Wild West wonderland just outside Yellowstone National Park. Opened June 2016 on a 10,260-acre working ranch, Tippet Rise is home to a sprawling outdoor art park, two performance venues and a visitor center. With the backdrop of the Beartooth Mountains, surreal large-scale land art by sculptors like Patrick Dougherty and Mark di Suvero pierces the horizon as bison, cattle or sheep graze nearby. Classical music concerts, screenings, and plays are held at the 150-seat rustic Olivier Barn and the open-air Tiara—both flush with acoustic design innovations. Big Sky Country’s newest art attraction was designed, including two behemoth stone sculptures, by Ensamble Studio of Madrid, Spain. Though the origin and meaning behind the original Stonehenge remain a mystery, its sequel has traceable origins. An art project by two rural Texas neighbors in 1989 is now a full replica of the original, albeit not as wide or as tall. And perhaps just to one-up its original across the pond, Stonehenge II also features two 13-foot tall Easter Island heads. To complete your unorthodox art getaway in Texas Hill Country, be sure to check out Barney Smith’s Toilet Seat Art Museum on your drive back to San Antonio. A museum with over 500 permanent pieces may not terribly impressive…unless they’re life-sized and submerged 10 to 20 feet under the sea. Museo Subacuatico de Arte, an underwater contemporary art museum in Cancun, opened in 2009. Known for creating underwater art around the world (his latest was in Spain), most of the creations are by English sculptor Jason deCaires Taylor. Due to the erosion and coral reef growth, the human statues give off a spooky Pompeii vibe. Scenes you might see: an overweight man watching TV from his couch; a woman, arms upstretched, singing to the heavens; or children facing out, holding hands in circle. The museum has three different sections. Depending on which method you choose to tour them, via scuba, snorkel, or glass boat, determines which part you’ll experience.